Welcome to another addition of RUBY TUESDAY - click on the logo above to head over to The Teach's blog to see all the entries this week. This little fella lives at the Memphis Zoo inside the Aviary exhibit. There is an open air section where the birds are flying all around and this guy/gal was hungry and zoomed in for some apple. I happened to be standing there and was able to get this shot. I am not sure why or how I missed the story of Josh Hamilton. He was destined to be a star. He was Carolina's Gatorade High School Player of the Year. Following his senior season, he was named High School Player of the Year by Baseball America and Amateur Player of the Year by USA Baseball. In 1999 he was the #1 pick of the Tampa Bay (Devil) Rays and signed for $3.96 million dollars. He spent a season and a half in the minors. Before the 2001 season he and his mother were involved in an auto accident. His parent, who prior to the accident had traveled with their son during his career, went home to allow for recovery. Josh, left on his own began experimenting with drugs and to drink heavily. He went into rehab at one point, but he was not ready. His 2002 season was ended early by chronic injures. By this point, Josh was using...heroin, cocaine and alcohol daily. In 2003 he showed up late at spring training and was reassigned to the team's minor league camp. He left the team and resurfaced several times, but eventually took the rest of the season off for personal reasons. Hamilton was hoping to return to spring training with the Devil Rays in 2004, but he was suspended 30 days and fined for violating the drug policy put in place by MLB. Because of the length of his suspension, and the terms of the drug policy, Hamilton must have failed two or more drug tests after being put into the program. A 'failed' test is a positive result for a drug more severe than marijuana. This suspension was increased several times after repeated violations of the terms of the program. He was out of baseball, basically not playing from 2002 until 2006. He had blown the entire signing bonus...he was down and out. With the help of an owner of a baseball academy, Josh began to get into baseball shape. Josh states he has been clean and sober since October 5, 2005. During the 2006 season he tried to sign with a minor league team but Major League Baseball blocked it based on his suspension which was still in force. Eventually the doctors told MLB that being in baseball would help in his recovery. After being selected in a supplemental draft by the Chicago Cubs, Josh was traded to the Cincinnati Reds. Due to rules regarding his being drafted, Josh was on the Reds roster for the entire season. Among all NL rookies, Hamilton placed second behind Ryan Braun in slugging percentage (.554), and fourth in home runs (19; behind Braun, Chris Young, and Troy Tulowitzki). He was shut out in the voting for the Rookie of the Year, which was won by Braun. This year, well this year he is playing for the Texas Rangers. He has 95 Runs Batted In at the All-Star break. To put into perspective, the most RBIs for an entire season was by Hack Wilson in 1931 and he had 191 when the game was different. He has a friend who travels with him. He is fighting his illness every day. Josh visits schools and groups and speaks to everyone who comes up to him at games to tell him about their brother/sister/parent/child who is going through what Josh did. In an interview this week, Hamilton stated "Now I'm not making this up, but soon after my sober date (Oct. 5, 2005), I had a dream about being in the Home Run Derby in Yankee Stadium," he said. OK folks, keep this in mind...This All-Star Game wouldn't actually be awarded to the outgoing Bronx ballpark until 2007. "So I didn't even know about an All-Star Game or Home Run Derby actually being held in Yankee Stadium, but I had this dream. And I didn't see how I did. All I saw was this microphone in my face afterwards, and how I got to share with people the reason I am back. "You can say that dream was a coincidence. But I don't believe in that." What Hamilton does believe in, with fervor, is the divine guidance that led him back to life, and to the people and the game that he loves. Last night Josh Hamilton was IN the Home Run Derby...IN Yankee Stadium! He was the last man to go and prior to his turn the most home runs hit was 8. Josh proceeded to hit 28 home runs in the first round... A new record. Three of them were over 500 feet. He did not win the competition but I can tell you that people might not remember the winner Justin Morneau, who topped a tired Hamilton 5-3 in the last round, giving him the derby title, but they will remember what Josh Hamilton did and is doing every day of his new life. At one point 55,000 people, most from New York were cheering a player from the Rangers!!! Cheering "HAM-IL-TON" and he later said he heard them and it gave him chills. As a final part of this story, the hitters in the HR Derby are allowed to bring the pitcher of their choice. Josh brought 71-year old Clay Counsil. Mr. Council was the American Legion Coach in Josh's home town of Cary, NC, teaching the game to Josh and his brother and throwing batting practice. He still throws batting practice to the team today. Mr. Counsil was at Yankee Stadium one other time in his life and that was for Game 5 of the 1956 World Series, when Don Larsen pitched a perfect game against the Brooklyn Dodgers. The gesture shows that Josh seems to be on the road to recovery...honoring the man who did so much for him early on in his life. Remembering what is important...Telling anyone who will listen about how he almost lost his dreams, his family, his life...and offering help to those in need. Dangerous Lee celebrates her birthday this week which gives us an excuse to have The Dangerous Lee Birthday Spectacular! Johnny Stuart, aka, DJ Johnny Danger, will get the party started as he’s done for some of the most prestigious and star-studded weddings and events. We’ll hear the craziest stories from the world’s craziest DJ. Johnny says, “I’m not like this weekend-cookie-cutter-wedding-bar mitzvah-MC-yell-at-your-guests kind of suburban Westchester nightmare, and you can quote me on that.” I believe I just did. Then, Dangerous Lee’s Friday night co- host and hip hop star Hassahn Phenomenon drops by with some birthday wishes. HP was on the Radio Happy Hour back in December and since then has begun his own radio career. We’ll find out what else has happened since his last visit, whether the back and forth flirtation with Dangerous Lee is real or just showbiz, and get to the bottom of his fascination with white women. And as if all that isn’t enough, Vinny Bond also drags his Big Leather Couch into the Radio Happy Hour Lounge to chat live with the listeners, Justin the Weatherman walks the fine line between funny and offensive and we’ll take your calls at 646-652-4804. You know, I'm not NEARLY the fan of baseball that you are, but I saw part of this on the news tonight, and they showed lots of clips. Unfortunately, they didn't go into the depth of Hamilton's story, so I didn't get the full impact. Now I get it. Great story! Thank you for sharing the inspiration! WOW!!! That's an amazing shot, Vinny! 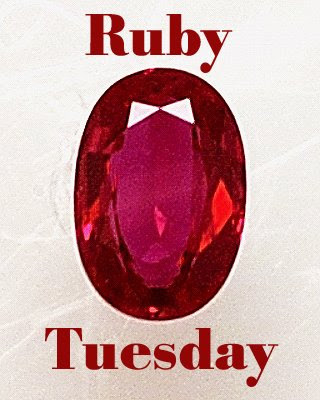 We have joined Ruby Tuesday for the first time this week (posted on the shiny and new photoblog). Oh I watched the Home Run Derby with rapt attention. I could not believe the Josh Hamilton story and as each HR accumulated I got more excited...when he hit 25 , beating Arbeu's old record, I got tears in my eyes. I am always touch by stories like Josh's having had some experience with people close to me who battled the disease of addiction. I also thought the announcers did a great job when telling his story. Its too sad to think about this being the last season in Yankee Stadium. It is indeed hallowed ground, I have had the good fortune to have visited it for a few games and even saw The Police there. Great shot of the bird. We have a similar exhibit here at the zoo, but I've never been fortunate enough to get a shot like that. As for Josh Hamilton? He is a success story for sure. And those 28 home runs in one round last night were amazing. I hope he continues to stay sober and on the right path. SONGBIRD: I figured some may have not heard the full story and wanted to share. DANA: You are so welcome. LEELEE: I rarely watch it but last night something drew me toward it and damn I am glad. I had missed this story completely. RWA: Thanks ...means a lot from you...It would be wonderful if he stays on the right path. The red-headed bird is most appropriate for Ruby Tuesday is most appropriate. I assume the tropical birds must love the Memphian summer. I hadn't paid attention to Josh, but 28 is a lot of HR. The focus on his game is what keeps him sober. 95 RBI at the break? What team doesn't need that?? It was a blast watching him shine last night. Cheers to Josh. Cheers Vin!! LEELEE: Another thing we have in common! Talk about coincidences...ESPN just ran a piece on Hamilton. OF course, everyone loved the Rays until they just dropped seven in a row. Let's hope they get back on track after the break. Now this was a post. As impressive as his sports accomplishments are (I'm taking your word on that) I'm far more impressed at what he's accomplished personally. For that alone he deserves kudos. Much more inspiring than stories about philandering big shot players and the wrecks they leave behind them. ANNDI: his on-field accomplishments are only important if he keeps his life together. Very nice post Vinny. Love the shot of the bird. MARGARET: Glad I could share. I know that many of my readers are not sports fans and I try to share some of these stories without focusing too much on the sports aspect. Fantastic story about Josh. Thank you for the "details." I'll be watching the All Star Game with the hubster and his folks this eve. I've never been to a game at Yankee Stadium but I did see the Yanks beat the pants off the Sox at Fenway - that was quite fun! I got so pulled in to how well you told Hamilton's story that I completely forgot what your Ruby photos was, had to go back up and look. Nice bird pic Bond. I love birds. Ctritters walking or flyin I'll take 'em all. Keep the bugs someone please. I'd heard of Josh & his story, but had not had an update for some time - thank you, it's awesome! Not a bird fan, but that's a nice shot! Josh Hamilton got a huge ovation when they announced him during the starting line up ceremony. I'm rooting for him to stay sober...that's what makes him a hero. The baseball stuff is gravy. Get this...the pregame stuff was so stirring that I actually cheered Reggie Jackson and Goose Gossage. That Yankee crowd sure gave Tommy Lasorda a great ovation too.